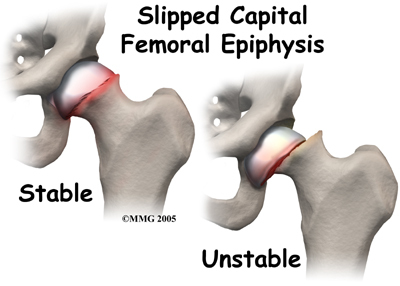 A slipped capital femoral epiphysis is a separation of the ball of the hip joint from the thigh bone at the upper growing end of the bone. his is due to weakness of the growth plate. Most often, it develops during periods of accelerated growth, shortly after the onset of puberty.